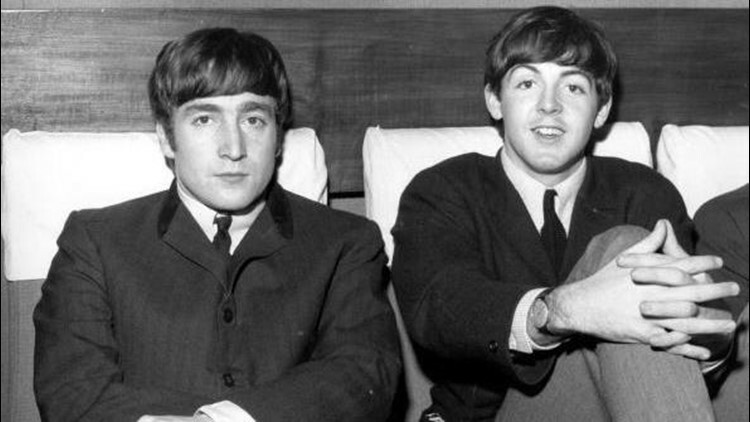 1st November 1963: Two members of Liverpudlian pop group The Beatles, John Lennon (1940 - 1980), singer and guitarist, left, and Paul McCartney, singer and bass guitarist. The photo was posted on Sean Lennon's Instagram account. A selfie posted by Sean Lennon with James McCartney Monday seemed to be a Beatles throwback to "Yesterday." The guys look eerily similar to their famous dads – John Lennon and Paul McCartney – in a filtered picture shared to Instagram. James, 40, whose mom is musician-photographer Linda McCartney, rests his arm on a guitar as Sean, Yoko Ono's 42-year-old son, appears to snap the pic. "Peekaboo..." Lennon coyly captioned the image. Instagram users commented on the kids' resemblance to their parents. "Is that John Lennon and Paul McCartney?" one asked. "Like fathers like sons!" exclaimed another. Others encouraged history to repeat itself. "Play together! You’re awesome," one person posted. "This is so cool!! Two sons of two amazing musicians! I hope you going to work together!" commented another. Maybe the offspring will "Come Together".